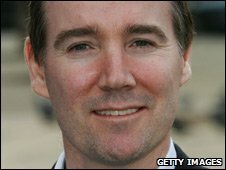 ITV has announced that Royal Mail boss Adam Crozier is to become the broadcaster's new chief executive. The announcement marks the end of ITV's long search for a replacement for Michael Grade, who said last April that he wished to give up the role. Prior to joining the Royal Mail, Mr Crozier had been the boss of the Football Association. Mr Crozier returned the Royal Mail to profitability, but the postal service has also been hit by strike action. ITV said he was due to take up the chief executive position "later this year". "ITV is a strong brand with talented people, facing an imperative for change as the media landscape evolves," said ITV chairman Archie Norman. The appointment of Adam Crozier is a surprise - as was that of the new chairman Archie Norman, who made his name turning around the Asda supermarket chain. It all suggests a shake-up is likely at Britain's biggest advertising-funded broadcaster. ITV's been hit hard by the slump in advertising, fierce competition for viewers, and the rise of the internet. Michael Grade - who was the executive chairman - has cut costs - and audiences and advertising are improving. But in the digital world, it must decide whether it should still be both a broadcaster and producer of programmes. "Adam is a very strong leader with a great track record in delivering transformational change." Mr Crozier said ITV was "a company with great heritage and one of the best brands in the UK". "The entire media sector is going through enormous change and that presents both great opportunities and significant challenges for everyone in the industry," he said. "The objective for ITV is to rise to those challenges and put itself at the forefront of change. I am very much looking forward to working with the people at ITV and leading the transformation ahead." ITV had been in talks with the former boss of BSkyB, Tony Ball, to replace Mr Grade, but the negotiations ended in September. Reports suggested ITV was not prepared to meet Mr Ball's wage demands. Royal Mail chairman Donald Brydon said: "Adam has done and continues to do a remarkable job in leading Royal Mail through a major transformation in extremely difficult market circumstances." He added: "We are in a hugely changing world. Working our way through that is tough but it's not about one man." Mr Crozier's main role will be to help ITV boost advertising revenues that have fallen in recent years because of the rising number of rival television stations available via satellite, cable and Freeview services. Last year, ITV sought the removal of restrictions on the amount it can charge advertisers, saying the rules did not reflect the changing market it now operated in. However, in a preliminary judgement, the Competition Commission rejected ITV's call, saying the firm still had a dominant market position. The Commission is due to make its final ruling next month.